White Shaka: Review: Robert Mugabe....What Happened? If you're one of those people with a $100 Trillion Zimbabwe banknote you will definitely wonder what to make of the NY movie premiere of "Mugabe - What Happened? "So many people flocked to the NY Institute of Technology theater that they had to open a second screening room. The audience response to the panel interview with director, Simon Bright and distinguished Zimbabweans might even have made your head spin. This documentary chronicled Mugabe's rise from obscurity to his position today with his signature trail of violence, economy-trashing and fine locution in clear, non-judgmental detail with the kind of archival footing only a genuine insider could get. Bright is a white Zimbabwean film director with impeccable credits as an anti-Rhodesian government activist in pre-independence days and a former official of the Zimbabwean Ministry of Agriculture. He adds current-day interviews with people who grew up or worked with Mugabe to this footage, painting a straight-forward picture of a very smart, determined man who rose to the top of his liberation group, wowing the Western powers as he overthrew Ian Smith's white rule. This is an Horatio Alger tale of an impoverished Jesuit-trained Shona boy with a single mother who is educated in Britain as economist and becomes a lecturer in Ghana where he witnesses black Africa's first post-colonial independence. 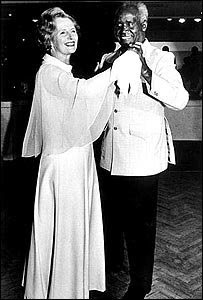 Then it is on to Zambia where their independence means we are treated to the supremely awkward Margaret Thatcher-Kenneth Kaunda waltz (worthy of its own documentary, I would say!). Mugabe gives up academia for the pursuit of self-determination in Rhodesia. First he joins Joshua Nkomo and the Matabele-led party only to drop them for the majority Shona tribe's ZANU Party, which he soon takes over and leads to victory. So, "what happened?" The young Mugabe comes off as hyperarticulate and forthright in a way that captains of industry once were before lawsuits, PR and TV consultants taught them to act humble. Once in power, Mugabe reaches out to the whites offering them "love." 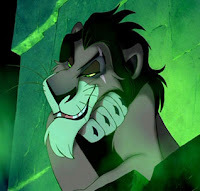 That's when you notice his resemblance to Scar, the evil, throne-stealing uncle from the Lion King. 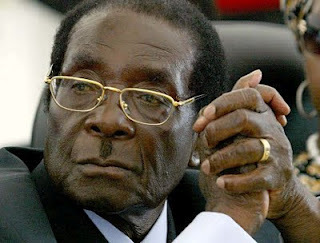 His trademark landing strip version of the Hitler mustache is still an ominous shadow while his deeply furrowed philtrum seems the embodiment of the new Africa's stiff upper lip. His accent and his manner resonate with a dapper Britishness, buttressed by Saville Row suits and a locution that lets him transcend his very un-British rat-pack gatherings with the likes of North Korea's Kim Il Sung, Fidel Castro and Yasser Arafat. Amazingly, peace holds, the old Rhodesian whites settle down and go about their way of living as if nothing had happened. They run their massive tobacco and wheat farms and rest assured that, as the backbone of the economy and employer of a half million Zims, their way of life is secure. Black Zimbabweans see an improvement in their lives, particularly in the form of education and all is seemingly well for 15 years or so. Since the Matabele are a breakaway from the South African Zulu tribe, they are without support anywhere - neither loved by the Zulus nor the Shona they displaced - and so this genocide was conveniently overlooked by all the powers that be. Do you know a Matabele, anyone? 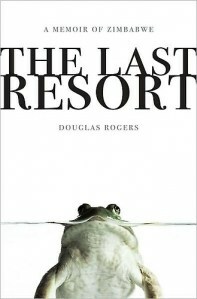 This brings us back to the night's panel (im)moderated by Douglas Rogers, author of the poignant but hilarious book about his family' survival in Zim, The Last Resort. Just as theywere going back and forth discussing the fine points of the documentary - how did Bright get the footage, was it film or digital, did he get permission to shoot (really? ), where will it be playing and so on - the audience began to rumble. They had far more pressing questions in mind as in: "what can we do about it?" Even that wasn't simple because many non-Zimbabweans, like Mugabe's partymembers, would rather see him as a hero than confront the damage he has caused. Within Zimbabwe, Mugabe isn't exactly a lonely dictator - he has a big party following with plenty of high-fiving military and political cronies, decked in outfits that could have looted from a Gilbert & Sullivan opera. The capital, Harare, is full of Mercs & Beamers that have flowed to insiders and savvy white and Asian businesspeople. It is only the dispossessed in the slums and countryside along with his hapless MDC opponents who experience his wrath and devastation. The panelists who knew him say he never changed. This is who is always was and the 1980s massacres were an early warning - Mugabe may wear European suites but he plays by old African rules and pity the fools who didn't get that. He may even be the embodiment of an old joke told in emerging-country circles about two smart third world guys who go to the Harvard Business School and promise to reunite after 10 years with whoever's richest being the host. The South Asian guy is the first, inviting his African college pal to his new palatial estate. He is stunned and asks "How did you get so rich?" The Indian guy tells his friend to look at the new superhighway passing in the back. "I raised the money from the IMF and I got a 10% commission." A few years later the African guy sends out his invite. Only this time the palace looks like Versailles with Neuschwanstein thrown in. "How did you get this?" his Indian friend asks. "I raised money for a superhighway too," the African guy says, "look around you." The Indian guy says that he can't see anything. "There's no highway - nothing at all. "Exactly," says the African "and so I got 100%." With Mugabe, the 100% came not from the IMF but from the War Veterans Benefit fund and may have been for his cronies and not necessarily for him. Once the veterans found out he had a real crisis on his hands if he wanted to stay in power. In any case, unlike the IMF, those guys don't make prissy speeches and cut off your credit cards while you go running to Bono for relief. They know how to fight with guns and bombs and they know exactly where you live. To get them off his back he invited them - with the assistance of his police - to invade the white peoples' farm. Think of Scar from the Lion King - beaming as marvels at this solution. It may be possible that Britain could have underwritten that loss but Tony Blair had already dropped their land redistribution payments, apparently because he thought it was being looted. The White Farmers could have paid off the veterans or for that matter, Mugabe. But neither of these options came up and one has to conclude from the dazed interviews and the "I built this place" kind of tone, that the white farmers don't normally think that way and just forgot where they really were. Payoffs would not have been very proper and it's adubious whether Mugabe could have been trusted. But, when in Rome. According to at least half the audience, Mugabe wasn't necessarily to blame. One questioner said that she lived in Zimbabwe at the time and since the rules of the game were written by the IMF in Washington and London, Mugabe was not at fault. Then there were another group, African Americans mostly, who felt that West had done enough of its own mischief from colonization, slavery and the economy that it had no business criticizing Mr. Mugabe. master of chimurenga, that slow-burn, very African style of music full of electronic thumb pianos, marimbas and percussion, who has played with Bob Marley, responded that the US and Europe "must do something." Apparently, he was thinking "Libya-style" but the crowd roared that it wanted an "African solution." Chimurenga is also the name of the liberation struggle. Unfortunately, they already have an African solution. Zimbabwe is a landlocked country that survives at the mercy of South Africa and no one, not even Mandela - back when he could have - saw any value in taking on Mugabe. Which brings us to the real message of Mugabe. I'd like whatever he's drinking. Think about it. He's killed tens of thousands, impoverished millions, turned the economy into a joke, beaten back two electoral losses - and by beaten, I mean with sticks, knives and serious guns - and here he is, in his mid-eighties riding as high as ever. Betty White has nothing on this guy! If you don't mind a little violence, he could be the poster boy for the AARP. It's hard out there for tyrant. Dictatoring is not that easy at 50 - but at 88! And he stills sounds about the same. It takes him a moment or two to warm up and the 'stache is getting a little raggedy but this one-man rule is definitely a healthy lifestyle. 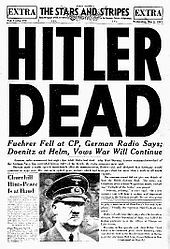 He laughs off the comparisons to Hitler - as he should - since Hitler, as we all know, was a loser. 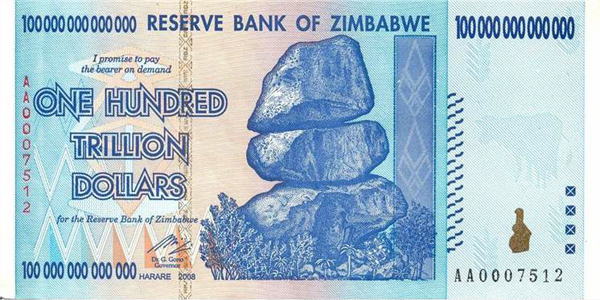 time they were going broke again and were looking to change their notes from trillions to gazillions, they found diamonds near Mutare. 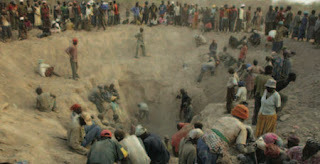 It took about 2 years for all $4 billion of those diamonds to, shall we say, de-carbonize - but it was enough to buy him more years in power and attract Chinese investment. They turned out to be less generous than he hoped, but rumors abound of more diamonds and mineral wealth. Mugabe has overcome his chief rival, Morgan Tsvangirai twice - even though he lost and the world backed his opponent. Those wacky Westerners allowed Mugabe to create a coalition government which would be something akin to putting your pet dog in cage with a pit bull and saying "nice dog." Better yet, make that a lion cage. 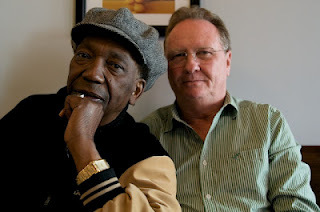 As for Thomas Mapfumo, who now lives in Oregon, and all those Zims, ex-pats and poor people left behind, you can only sympathize. Or not, if you choose. One member of the audience was a freshly arrived college student from Harare who expressed amazement at all these negative stories about their great hero. And she has a point. If Hitler had stuck it out, the Reich would probably seem like an admirable regime today and the 'stache might even be a fashion statement. In a bizarre way, this is almost happening within Zimbabwe. As for American intervention, it has already happened. 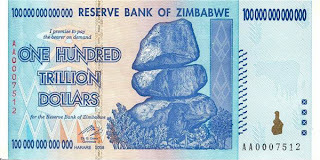 The $100 trillion notes have been shelved along with the Zim dollar and now the economy runs on our greenback. It could be worse - it could be the yuan. As for Mugabe, at this point, only the Lion King could take him out. Simba, where are you?